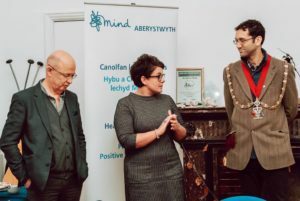 Mind Home › General › Mind Aberystwyth – The Next Steps! On Wednesday 5th December, we held an open event entitled ‘Next Steps’ to showcase our new premises, existing services and plans for 2019. Partner organisations, commissioners and funders from across the county were invited to find out more about what Mind Aberystwyth can do for anybody who wants to improve or maintain their mental health, and we were delighted to see so many of them attend.